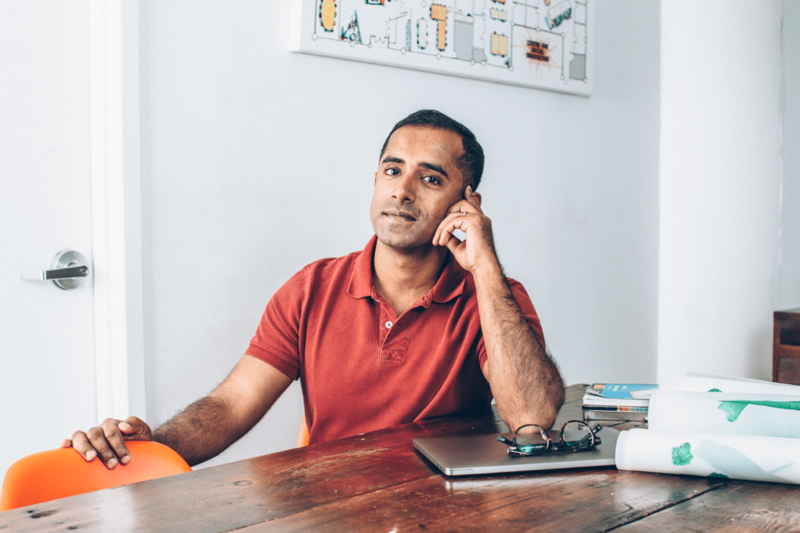 Entrepreneur Adarsh Alphons made a name for himself when he founded ProjectArt, the largest free art school for children in the United States, working with underserved communities. Now he is turning his passion for social impact to the world of fashion. His idea? Wardrobe — a platform that allows people to rent out their own clothes. Tell me a little bit about how the app works. Wardrobe is essentially an AirBnB for clothes. You’re basically saying “Hey, if you want to look nice, look great for an event, don’t go and drop hundreds of dollars buying that stuff, which you might not wear as frequently. Just borrow it from someone.” It’s essentially scaling up the experience of borrowing from your best friend, except it’s people online. But a lot less intrusive, because this involves not even meeting with the person. Literally you can access any closet you want in New York City by just walking over to your dry cleaner, which is a Wardrobe Hub. What are Wardrobe Hubs, and how do they work? After you wear it you don’t have to worry about cleaning it. You can drop it off wherever you want. The rentals are for a week at a time. It really is built to make it convenient, with the flexibility that’s needed for an urban, working, professional woman. The dry cleaners we work with also have changing rooms and tailoring services, so you can actually try on something to see if it fits you the way you want it to fit. If it doesn’t you can return it right there. And if something tears, like a button comes off, the tailor will fix it right up. How much money do you think people renting on this app can make? It really depends on how many items you put on the platform, obviously. Your closet size. The average person has between 10 to 15 items [on the site], but the average woman in the US has about 103 items in her closet, roughly 80% of which she doesn’t wear often. Let’s say even half of that — 40% of that — is put on there. It has a much higher chance of being rented out, because it gives people more options. It’s going to show up in more search results. I would say the low estimate, if you’re really active on the platform, a couple of hundred dollars a week. It could pay your rent in terms of how much you could make per month. The average rental price on the platform, just FYI, all-in (including cleaning) is about $45 [for a week]. How does Wardrobe differ from other apparel rental services on the market? The closest comparison we have is Rent the Runway. Rent the Runway’s average price point is $72.30, and that’s for four days. One of the issues of Rent the Runway that I hear is within four days you have to put it in the mail. By the fourth day if for some reason you are not able to find a mailbox, weather is bad, whatever it is, you get charged $50 a day until [you’ve been charged] the price of the item. You want to give people flexibility of how long they want to keep it, to be more forgiving for a busy person. What designers do you think will perform the best on the site? Who gets searched the most? Obviously items like Gucci are very popular. Guess, Mansur Gavriel. And then Chanel and Ganni — these guys are getting quite a bit of visibility. A lot of DVF too. How are you ensuring that there will be things like size diversity, and options available for a variety of people? It’s hard to guarantee that. But from day one we started on-boarding [diverse] closet owners. Body positivity, diversity, and gender fluidity has been part of our ethos since day one. We have been very conscious in on-boarding users on that side. We can actually see how many items of each size we have on the platform. In fact, the size you will find least on the platform is probably a size 0 or a size 2. If you go on the app one of the things you’ll notice [first] is the photos. The photos are not of models, they’re actual users wearing their clothes. Actual users wearing their [own] clothes look really good. The best person to don their clothes is themselves: the person who owns it and the person who found it. Why is sustainability important to you personally? One of the reasons I got into this was because of the social impact of this all. Just realizing how toxic fashion has become. Close to 75% of what’s manufactured is basically wasted in the first three years. Not to mention all the garbage and waste that’s produced during the manufacturing phase itself. It’s like, a waste thing on both sides. We really are burning the candle on both ends. Consumption, particularly with plastic, has gone up so much. It’s only getting worse…In the United Kingdom last year there was 3.6 billion items of clothing that completely went untouched in people’s closets. That’s close to half the population of the entire world. Half the earth could be donned in those clothes! If we could put even a small percentage of that into circulation…if people were not over consuming, it would make a huge dent in waste output that we currently have. How did you get the idea to start this app in particular? I think I was searching for my next big thing, next problem to solve. I was visiting my parents in India, in church actually. It was a wedding type thing; not exactly the most interesting ceremony. It was three hours long, and my mind wandered. I thought about my bedroom back in Harlem where I live, and I remember just thinking I have all these jackets that I haven’t worn in years. I have these tuxedos, and I was just about to buy this other suit for my friend’s wedding (because I was part of the wedding party) that I did not like in the first place but I had to do anyway. If there was some guy who wanted to borrow this from me and pay me $50 for the week and return it dry cleaned, I would totally let him have it. Why hasn’t anyone thought of this? I started to go down that rabbit hole. What happens if a piece gets ruined either by a lender or by the person borrowing it? The most important thing is that it’s peer reviewed. If you’re not good with someone, you get a bad review from the owner. If you get a one star and a bad-review, likely when you make your next request, it’s not going to be approved. The peer review thing is so powerful now. You put the power back into the community and let people decide for themselves who is good and who is not. Then basically we have insurance that in a worst comes to worst scenario it’s covered. Everything is covered. It’s like a personal item insurance. We use our insurance only as a last resort. [Also], let’s say I’m renting from you. Until you get the item back in one piece and in good condition, my financial information sits on the platform. So I can’t borrow your stuff and then close my account and financial information until the item is returned back to you. The reason we save the financial information is in case something happens to the item we either hold a digressional, like basically being able to charge more if something happens. Lets say the person loses the item: we can charge the person up to 1.5 X the value of the item if they’re completely missing with the item and just don’t respond, things like that. The other thing is more like an Airbnb scenario. Lets say I borrow something from you and I was running and my pants caught the side of the table and ripped. The tailor can fix it at these locations, but it’s going to cost $20. I cover that [myself] and it’s back in shape! You give me a good review I give you a good review, done. We let people do these transfers of money off platforms, so people do that with [something like] Venmo to take care of that situation [themselves]. Have you ever had to go through one of these issues? I find this shocking: out of all the rentals that have happened so far (we’ve had quite a few), not even one item was returned in a condition that was anything less than great or acceptable. It just shows that people are ready for something like this. They respect somebody else’s items, and they take care of it as if it’s their best friend’s thing.